In our online bus ticket shop it is possible to buy tickets for the national and international routes. Use the search form to find departure and arrival times as well as ticket prices. Panturist is, along with App, the leading scheduled coach service operator in eastern Croatia and a member of the international corporation Arriva by Deutsche Bahn, present in 14 European countries. Panturist offers intercity connections in eastern Croatia and long-distance passenger transport between eastern Croatia and Zagreb, Dalmatia, Istria and Kvarner. Besides domestic bus routes Panturist offers excellent connections to numerous international destinations, such as those in Germany, France, Slovenia and Serbia. 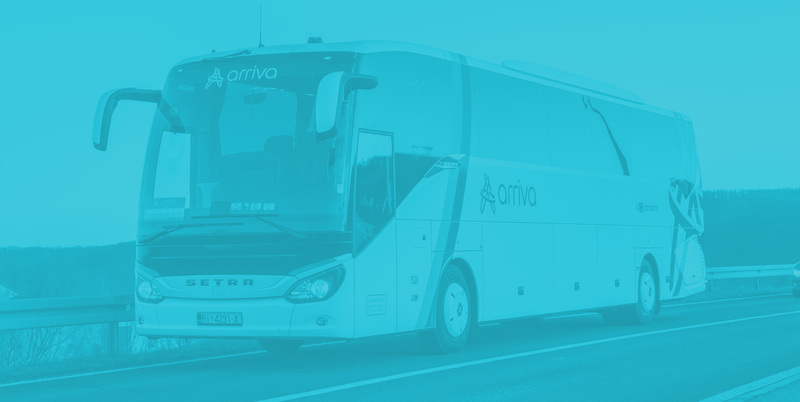 As a part of the Arriva group, through its own travel agency Arriva travel, Panturist offers sale of tickets and transport to festivals, concerts, matches, excursions and booking of accommodation in hotels, hostels and apartments and coach rental. How can you recognize Panturist buses? Considering that rebranding is in progress, Panturist's white-colored buses with a red “Panturist” inscription and grey or dark green Arriva Express buses are being changed to white buses with the Arriva logo in blue or blue buses with the Arriva logo in white color. The fleet of Panturist is among the newer ones in Croatia, which means high quality and offer transportation with modern, comfortable and air-conditioned buses, with free WiFi service and outlets for charging electronic devices.